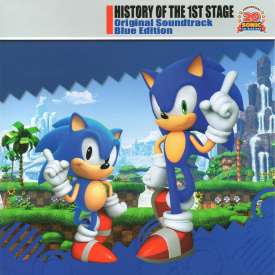 History of the 1st Stage Original Soundtrack Blue Edition is an album that was only available as a pre-order bonus for the Nintendo 3DS version of Sonic Generations. Released exclusively in Japan, the artwork for both this and its companion White Edition were dressed to match the other Sonic the Hedgehog 20th anniversary musical offerings from Wave Master. Both this album and History of the 1st Stage Original Soundtrack White Edition were put together for the Sonic Generations: 20 Years of Sonic Music CD that was included with copies of the Collector's Edition of that game. "Midnight Greenhouse," "Lovers," "Right There, Ride On," and "Let the Speed Mend It" are all listed on the album's track list not by their official name, but by the level in which they were first heard. Also, both "Plant Kingdom" and "Tropical Resort" neglect to mention they are the Act 1 mix of each. This page was last edited on 9 October 2018, at 22:09.